Oz Clarke, The History of Wine in 100 Bottles: From Bacchus to Bordeaux and Beyond. Sterling Epicure, 2015. It was an instant hit with history-hungry Britain. Never have the artifacts of the British Museum’s collection been so closely studied and appreciated by millions! And of course the use of physical objects of various sorts was perfect because, as we all know, we are living in a material world and so telling the story of civilization through material goods is simply irresistible. You can see a list of the objects here and briefly view each one in the 5 minute video below. In another brilliant move, the organizers did not present the series on the television or the internet as you might expect but via one-hundred short 15-minute BBC Radio 4 broadcasts starting on January 18, 2010 and ending on October 22 of that year. Neil MacGregor, the museum’s director, wrote and narrated all the episodes. The combination of rich language plus fertile imagination inspired listeners to seek out information about the objects through all available means including visits to the British Museum (which must have been one of the goals of the enterprise). Watch the video and click on the website link — maybe the hundred objects will fascinate you as they have so many others. Oz Clarke takes something of the same approach to the history of wine in his new book and the result is very appealing indeed. Clarke’s challenge is to tell the story of wine in 100 short, punchy, chronologically-ordered episodes. 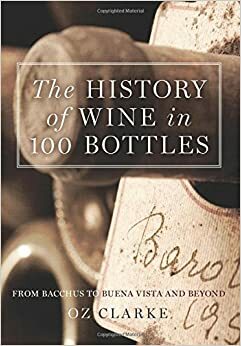 Some of the chapters are about actual bottles as promised by the book’s title (1964, for example, is a jug of Gallo Hearty Burgundy), but most are the stories of people, events or forces that shaped significantly the world of wine. Thus 1855 is the Bordeaux Classification of that year and 1863 is Phylloxera. 1965 marks the invention of bag-in-box containers and 1976 the famous Judgement of Paris. The story begins with the invention (or was it a discovery?) of wine in about 6000 BC and concludes with Rudy Kurniawan’s wine fraud conviction in 2014. I think there is something here for all wine-lovers to enjoy and appreciate, although I understand that some will criticize the entries for being too brief (more of the 2-page landscape given to each entry goes to images than to text) and others will find fault with the particular entries chosen and not. Regarding the depth of analysis, I think you have to accept this for what it is and, like the BBC/British Museum project, see this as an invitation to further study rather than a much too brief final chapter. Regarding the topics the Clarke included versus those left out, I think it is inevitable that people disagree about what’s most important — and maybe there’s fun in arguing about it a bit. I was pleased that many of the people, events and forces that I have written about here on The Wine Economist and in my books were important enough to be included in Clarke’s book. I’ll gladly defer to him where we might disagree because after all it is his book not mine, but I was happy that we agree in so many areas. For example my chapter on “Extreme Wine People” in Extreme Wine highlights a number of individuals who transformed the idea of wine in one way or another. Almost all of them make Clarke’s list including Robert Mondavi (1966), Angelo Gaja (1968). David Lett (1975) and Nicholas Catena (1994). I highlighted Montana’s Brancott Estate in Wine Wars because that’s where the first Sauvignon Blanc vines were planted in Marlborough, New Zealand. Sure enough, that’s Clarke’s entry for 1983, And world’s highest vineyards (in the Salta region of Argentina) appeared in the first chapter of Extreme Wine and as the entry for 2006 here. Here’s a selection of other chapter entries to whet your appetite and give you a sense of the variety of topics presented: Pompeii (79 AD), Tokaji (1571), Constantia (1685), Dom Perignon (1690s). Chianti (1716), Louis Pasteur (1860), Vega Sicilia (1915), Mateus (1942), Emile Peynaud (1949), Robert Parker (1978), Canadian Ice Wine (1991) and China (2011). The History of Wine n 100 Bottles is fun and informative — a great gift for your wine enthusiast friends and a colorful addition to any wine bookshelf. By the way, if you are interested in projects like these, you might also want to read Tom Standage’s 2006 book A History of the World in 6 Glasses. 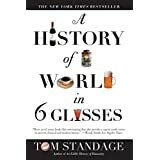 The glasses, in chronological order, are filled with beer (in Mesopotamia and Egypt), wine (in Greece and Rome), spirits (in the Colonial Period), coffee (in the Age of Reason), tea (the British Empire) and Coca-Cola (in the American Century). There’s a seventh glass that represents the future. What does it hold? Water, of course. I was keen to get a copy of Oz Clarke’s book when it was published because I’ve started work on a project that has something of the same flavor. Although Money, Taste and Wine: It’s Complicated won’t be released until August, I’ve been at work for some time now on the next book in the series, which I’m calling Around the World in 80 Wines. Don’t you think that’s a great title? My challenge is to write a great book to go with it! I wanted to see what Oz Clarke would do with his hundred wines and, while I can’t fault his use of the BBC/British Museum model, that’s not the way that I’m headed. Clarke and the BBC make a journey through time and I’m traveling through space — around the world, with 20 stops (chapters) and 80 wines. Some chapters search out and find a single most significant wine story wine while others reveal a treasure trove of different wines — or search and search and come up empty. How annoying! But journey’s don’t reveal their significance all at once or in carefully measured doses. They ebb and flow like life itself and that’s what I’m going to try to capture. I’m sure that some will second-guess my choices and want more depth here and less there but, as with the BBC/British Museum’s series and Oz Clarke’s new book, I think you’ll find the result worth the effort. — fun, interesting. Maybe even irresistible!